From grinding the grain, to distilling our liquor, everything we do here is made through passion and care. 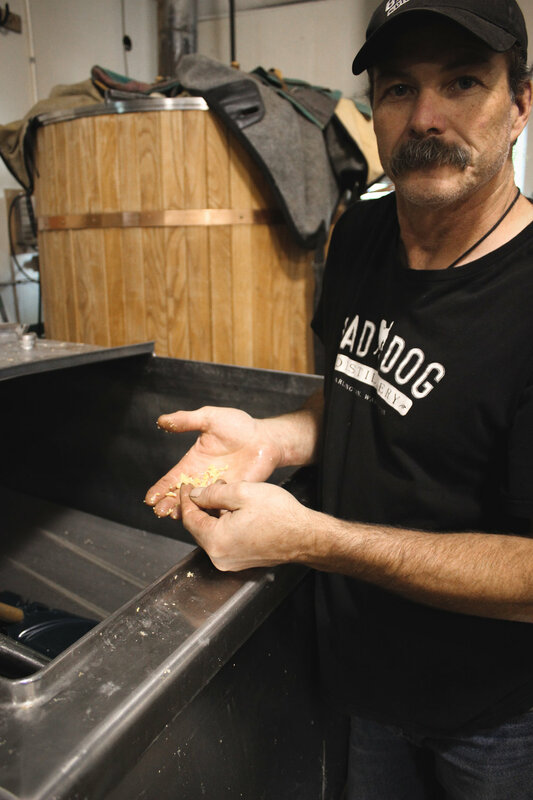 Making Whiskey involves many steps and here at Bad Dog Distillery we pride ourselves on being a grain to glass distillery. Being grain to glass means we do everything on site from grinding our grain to bottling our spirits, hence “grain to glass”. We feel that being in control of every step is important so everyone knows exactly what is going into our alcohol. Our first process will always begin with getting our grain of course. Staying local is very important to us so everything we use is from Washington State. Once we pick up the grain, or have it delivered, we will then store it and grind the amount needed for our next batch. Mashing will be the next step taken, which is the process of converting the starches from grain into sugar. During this time we are very careful to keep our mash ton at specific temperature to be sure that everything comes out exactly how we want it. Once our mash is to the right consistency, we will then transfer it into what is basically a giant strainer. This process can sometimes get messy, but boy is it worth it in the end! The reason we strain the mash is to separate the wash from the solids. The solids are the leftover grain that we will send to farmers to use as feed. The wash is what will then go into our copper pot still and soon become alcohol. But first we will transfer the wash into a tote and pitch the yeast. The tote will then sit for a few days before transferring into the still. The distilling process itself can take many hours. We watch the temperature closely for that as well. Most of what comes out of our still will go into a barrel to become either Whiskey or Bourbon. Some of it we will keep unaged and some we will use to create a flavored whiskey out of. And our final step is to bottle! We do all our bottling here at the distillery. By hand, we will bottle, cap, seal, label, and box! This process consists of a lot of hard work and passion. We are very dedicated to create the highest quality product as possible for our customers to enjoy.